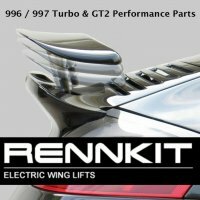 Started up RennKit LLC to supply replacement electric spoiler Rams to the 996/997 turbo owners. 2003 Carrera 4S - Speed Yellow with GT2 Nose and PSE! 997TT wing hydraulics pump in 996TT? I doubt it - the rams are shorter, thus the syringes in the pump assembly are probably of different volume as well. I'm surprised the moderator allows a brand new poster to create a new thread and put an obvious ad in for a product complete with web address and logo. This thread was an obvious attempt to advertise a product. He did the same thing on Rennlist with his post #1. Anyhow thanks for the props Michael. I've never known an engineer to be so cavalier about precision, In the spirit of the forum it would have been helpful if you'd just answered the question ..... Are you serious? Engineers make decisions every day about precision, and how much is needed. Unbelievable comment - obviously from a non-engineer. Working on getting them on my Rennkit site. You can find the factory troubleshooting guide at the bottom of this page: http://rennkit.com/why-factory-set-fails/ Good luck. I've had some experience with Matt at Eisenbuds 303-825-0322, installing my eRam spoiler hydraulics replacement kit. I have to agree - and I'll be kind here - the air filter replacement is a very difficult job. the housing design leaves much to be desired. Source of switched power in engine bay? occasionally - few times a year. more blue-whiteish. Both sides far as I know. I tried the cheapo's from China a few times... last a few months then dim. Worthless. I'd be up for some nice super bright long lasting LED's if they existed.